We think of starfish as rigid and immobile, but that is not always the case. This fellow, an Echinaster Sepositus, was scooting along so quickly that I had some difficulty keeping him in the viewfinder of my Nikonos IV-A underwater camera. Taken at a reef in the Coral Sea, about 200 miles off the east coast of Australia. 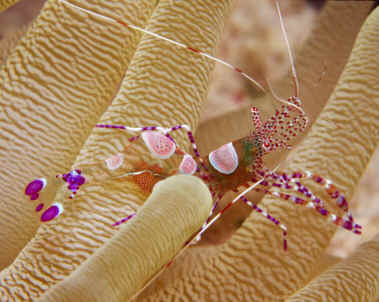 Tiny, nearly transparent Pederson's Cleaner Shrimp live protected within the arms of anemone. 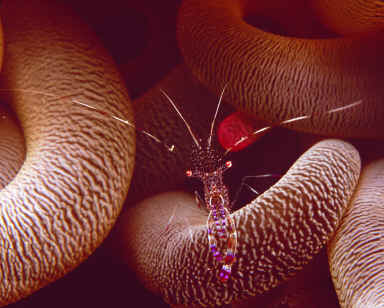 The Spotted Cleaner Shrimp also enjoys the protection of the anemone, and cleans harmful parasites from its arms in return. 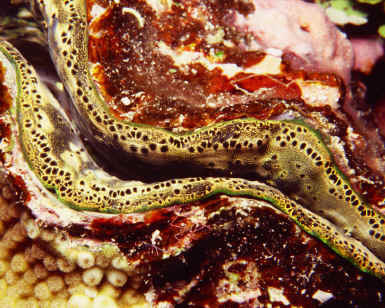 On the other end of the size scale, the giant clam can ensnare fairly large intruders, but does not close nearly as quickly as the movies would have one believe. 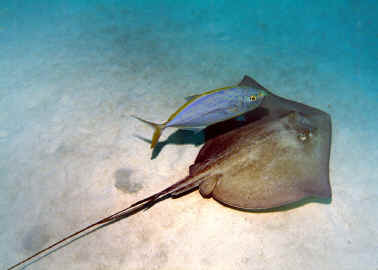 We noticed that stingrays always seem to have a "friend" who accompanys them, serving as a lookout and also dining on things the ray stirs up from the bottom. This "friend" is a Yellowfin Tuna. Taken in about 30 feet of water near Little Cayman Island.